It's pathetic that so many public companies miscalculate EBITDA (earnings before interest, taxes, depreciation, and amortization) and violate Regulation G governing the calculation of non-GAAP measures such as EBITDA. 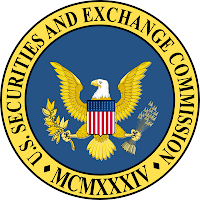 It seems that too many CFOs, Audit Committees, and auditors don’t take the time to thoroughly review compliance with all appropriate SEC financial reporting rules. Starting in 2007, I reported improper EBITDA calculations by Overstock.com (NASDAQ: OSTK). After a brutal yearlong public battle, Overstock.com's embittered CEO Patrick Byrne finally changed his company's EBITDA calculation to comply with Regulation G. For additional details, please read Lee Webb's Stockwatch article and Richard Sauer's book. 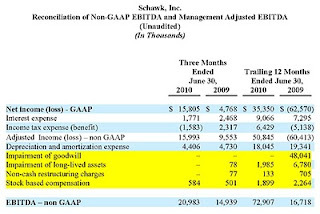 In other words, the only way to properly compute EBITDA under Regulation G is by starting the calculation with net income and adding back only interest, taxes, depreciation and amortization. A public company cannot add back other items such as stock-based compensation costs, impairments of fixed assets, or anything else to compute EBITDA. 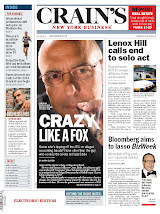 Such errors can materially overstate EBITDA and lead to potential regulatory sanctions. Any different calculation cannot be called EBITDA, but can be called "Adjusted EBITDA" or some other appropriate name. The acronym EBITDA refers specifically to earnings before interest, tax, depreciation and amortization. However, your measure also adjusts earnings for stock option expense. We will not object to your using such a measure as a liquidity measure but request that you rename it to avoid investor confusion. Like CGG Veritas, Overstock.com, Penson Worldwide, and Comtech Telecommunications erroneously included stock-based compensation in their EBITDA calculations. A. H. Belo Corporation, FirstService Corporation, Animal Health International, Inc., Schawk Inc., and Penn National Gaming Inc. all erroneously included asset impairment costs in their EBITDA calculations and some of them also made multiple errors by including other items such as stock-based compensation costs in their calculations. 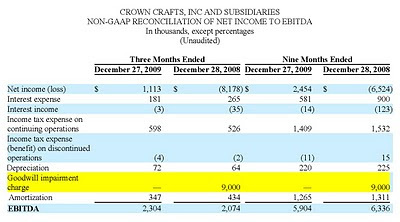 In February 2010, Crown Crafts (NASDAQ: CRWS) erroneously included an adjustment for “goodwill impairment charges" in its EBITDA calculation. See yellow highlighted item from the company's 8-K report below. Click on picture to enlarge. In future filings, if the Company includes an adjustment to EBITDA, then the Company intends to use the title “Adjusted EBITDA” instead of “EBITDA”; and in such instance, the Company also intends to appropriately define the non-GAAP measure (e.g. “Adjusted EBITDA is defined as earnings before interest, taxes, depreciation, amortization and the goodwill impairment charge.”). Like Crown Crafts, both A. H. Belo and FirstService erroneously included asset impairment charges, such as goodwill impairment, in their EBITDA calculations. See yellow highlighted items from A. H. Belo's recent 8-K report below. Click on picture to enlarge. See yellow highlighted items from FirstService's recent 6-K report below. Click on picture to enlarge. 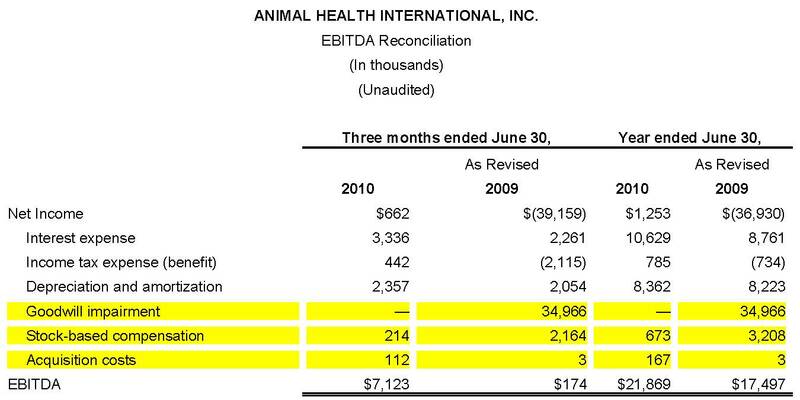 Animal Health erroneously included goodwill impairment, stock-based compensation, and acquisition costs in its EBITDA calculation. 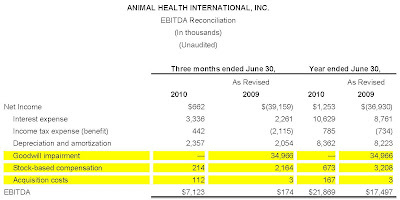 See yellow highlighted items from Animal Health's recent 8-K report below. Click on picture to enlarge. Schawk erroneously included impairment of goodwill, impairment of long-lived assets, non-cash restructuring charges, and stock-based compensation in its EBITDA calculation. See yellow highlighted items Schawk's recent 8-K report below. Click on picture to enlarge. 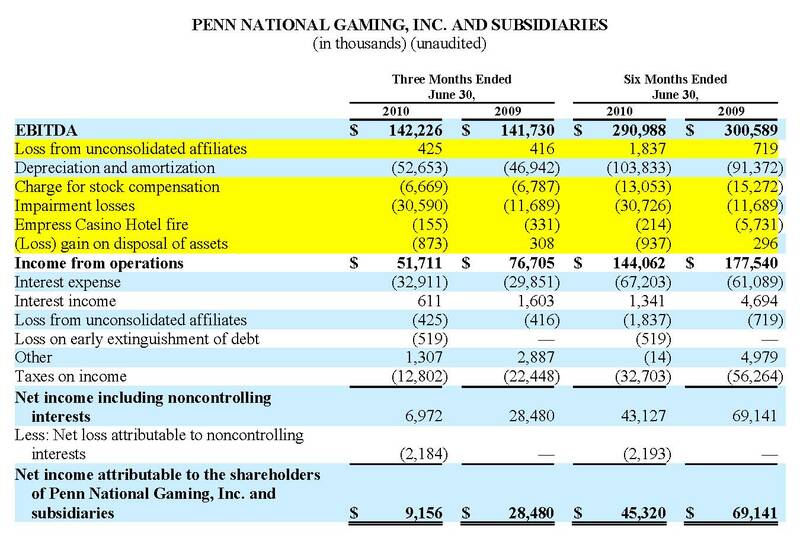 Penn National Gaming was the worst offender in erroneously calculating EBITDA of all the companies discussed so far. The company erroneously defined EBITDA as "income (loss) from operations, excluding charges for stock compensation, impairment losses, Empress Casino Hotel fire, depreciation and amortization, and gain or loss on disposal of assets, and is inclusive of loss from unconsolidated affiliates." As I detailed above, EBITDA is defined by the SEC as net income (not operating income as used by Penn National Gaming) before interest, taxes, depreciation, and amortization. In addition, stock compensation, impairment losses, Empress Casino Hotel fire, gain or loss on disposal of assets, and loss from unconsolidated affiliates cannot be properly included in an EBITDA calculation. See yellow highlighted items Penn National's 8-K report below. Click on picture to enlarge. CFOs, Audit Committees, and auditors of all the public companies need to study SEC rules governing the calculation of non-GAAP measures such as EBITDA and follow them. I will continue tracking future financial reports, especially reports issued by the companies cited here, to see if they miscalculate EBITDA and violate Regulation G again. Avoid the embarrassment and possible SEC scrutiny! Please read important disclosure at bottom of this post. 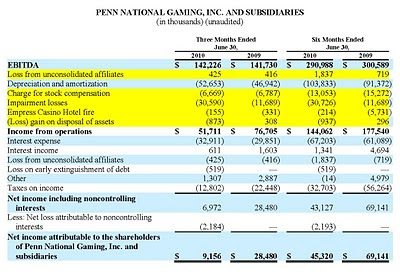 For example, Penn National Gaming (PENN) erroneously reported EBITDA as earnings before interest, taxes, depreciation, amortization AND charges for stock compensation, impairment losses, disposal of assets, losses from unconsolidated affiliates and the Empress Casino Hotel fire--that would be an "Adjusted EBITDA" or in PENN's case, EBITDASCILDALUAECHFIRE. Recently, I exposed GAAP violations by Overstock.com (NASDAQ: OSTK) which caused the company to restate its financial reports for the third time in three years. 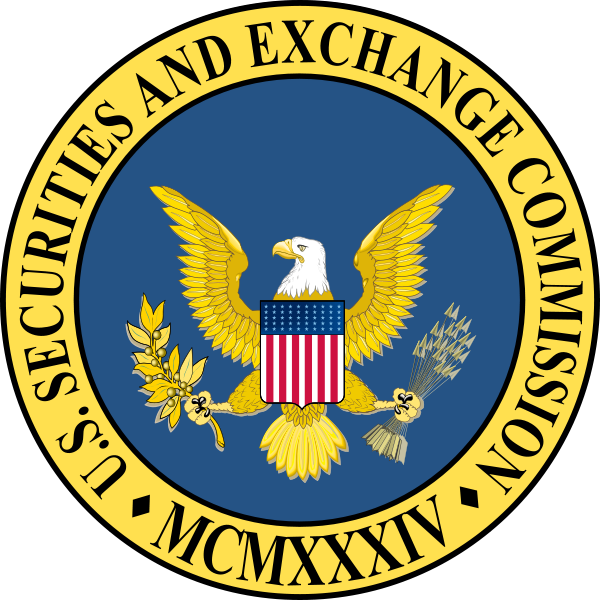 The SEC is now investigating Overstock.com and its CEO Patrick Byrne for securities law violations (Details here, here, and here). 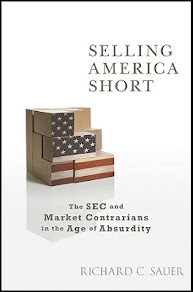 I do not own any securities in the companies cited in this blog post, long or short. My investigation of these companies is a freebie for securities regulators to get me into heaven, though I doubt I will ever get there.